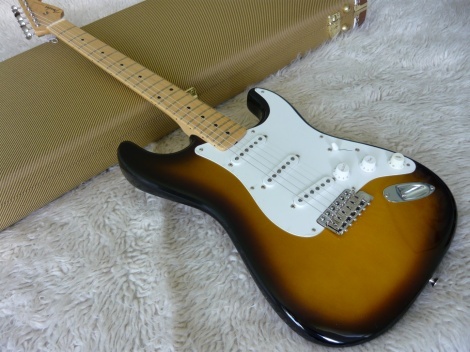 This is a very playable, beautiful tone Fender Historic Reissue. For you Fender Lovers, The mojo is real and the old school is prevalent. It is the real thing, just dig it !! The American Vintage '56 Stratocaster® guitar takes you straight back to mid-1956, when the model was still new and when what is quite possibly the most prized and popular neck ever affixed to the instrument first appeared—a thick one-piece maple neck with a soft "V" shape and comfortably rounded edges. Such meticulous authenticity even extends to the single-ply white pickguard with eight holes, lightweight alder body with deep contours, and vintage-accurate pickups, bridge saddles, tuner spacing and more. American Vintage '56 Single-Coil Strat Pick ups.